Digital textbooks don’t weigh me down! Academic publishing has been trending away from printed textbooks toward digital and more modular, interactive, personalized, and open information type content. So tonight we are going to examine two major players in the e-textbook world: Vital Source (owned by the distributor Ingram Content Group) and CourseSmart (a consortium of five major academic publishers — Cengage Learning, John Wiley & Sons, Macmillan Higher Education, McGraw-Hill Education and Pearson) AND how Vital Source’s acquisition of CourseSmart and their subsequent analyses and business decisions will affect and drive what has become known as the future ‘post-textbook world’. The source research article is packed with intriguing numbers, links and statistics. The e-textbook platform Vital Source on Monday acquired CourseSmart, the academic publishing industry’s door to the e-textbook market. The deal could signal a change in the publishers’ attitudes toward digital educational materials. Founded in 2007, CourseSmart was a consortium of five major academic publishers — Cengage Learn Wilening, Johy & Sons, Macmillan Higher Education, McGraw-Hill Education and Pearson — forming a common front in the e-textbook market. The company now estimates it offers more than 90 percent of e-textbooks used in higher education, and its list of partners has grown to include more than 50 publishers. CourseSmart recently expanded its rental options, rolled out user analytics and introduced interactive coursework elements. But even with publishers backing the company, industry analysts have for some time predicted CourseSmart was due for a course correction. Vital Source, the platform owned by the distributor Ingram Content Group, has more than 4 million faculty and student users — a number that will be bolstered by CourseSmart’s more than 1.5 million faculty accounts. By acquiring CourseSmart, Vital Source also gains a deeper catalog of e-textbook titles. The terms of the deal were not disclosed. The acquisition also means Vital Source will be better positioned to sell its products directly to consumers, which Joseph J. Esposito, a digital media, software and publishing consultant, said puts the company in direct competition with many of its customers, including college bookstores. “So Ingram has done what most people thought they would never do: migrate downstream to participate at retail,” he said. In response, Freeman said Ingram is “not fundamentally a consumer-facing retailer,” and that the company is “mindful of competing” in that space. Michael Feldstein, who along with Hill last year founded the firm MindWires Consulting, said the acquisition could be interpreted as the publishers backing away from the e-textbook industry to focus on other digital products. 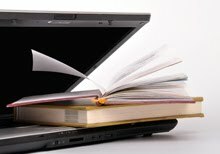 States Adopt Digital Textbooks–What Took Them So Long? For the un-initiated (of which I was a member until very recently) many states have what they call adoption state review boards for approving educational and instructional materials/textbooks for use in their school systems. Well, these ‘know-what’s-best-for-you’ review boards have finally begun to approve digital formatted textbooks as legitimate…primarily to save costs in this currently ruptured economy…but, hopefully, they also realize the new digital formats encourage student interaction and engagement with more complex content. In an effort to increase student engagement with content while decreasing spending on textbooks, adoption state review boards are incorporating digital programs into their strategy. According to 2010 National Textbook Adoption Scorecard and 2011 Outlook, a new report published by Simba Information, the lingering recession is pushing adoption boards to reconsider how they define the textbook in the 21st century. Expanding the adoption process to include digital programs is a growing trend in the adoption states, first pioneered in West Virginia. Motivated by anticipated cost savings, various adoption boards have purchased more digital materials than in previous years; however, they have not yet begun to replace textbooks. Quite often, there is confusion in the relationship between print textbooks and their digital counterparts. Some people incorrectly assume that they compete with each other, when in fact, they are the same product offered through a different medium. Top publishers, such as Pearson’s enVisionMATH and Houghton-Mifflin Harcourt’s Journeys, offer a multimedia-formatted digital program that mixes a full digital path with print textbooks. Simba expects publishers to expand digital offerings, especially for reading, in their bids for Texas adoptions next year. Next year may well be the strongest outlet for digital programs in textbook adoption states we will see.